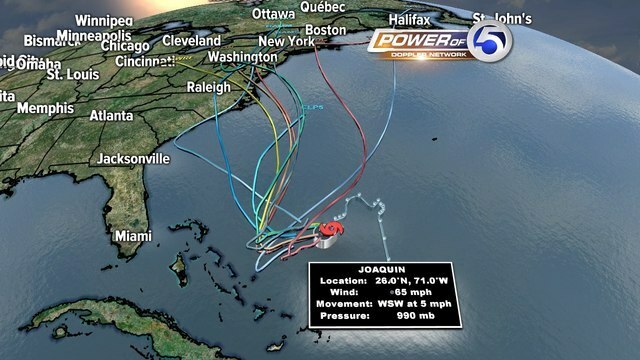 Is Hurricane Joaquin heading to Cleveland? Heavy rains, high winds, coastal flooding. It's all on the table right now as we await what Hurricane Joaquin will do. Right now, Joaquin is spinning just east of the Bahamas. Nothing to steer it north...yet. But the current weather picture is complex. We are transitioning from a summer-like warm weather pattern east of the Mississippi River to a more fall-like one this week. A cold front dropping south, combining with abundant tropical moisture from the Gulf of Mexico will cause major flooding issues for the northeast states down to the Carolinas today thru Thursday..
And that's BEFORE Hurricane Joaquin becomes a player. So, with so many things happening on the current weather map, it's no wonder the computer models are having a really hard time deciding where this hurricane is headed. But, what has many of us concerned: the majority of the guidance programs bring this storm precariously close to the US Mainland by late this weekend into early next week! Notice the image above. Each line represents a separate computer model path or "track" for Joaquin. This is known as a spaghetti graph for obvious reasons. Notice how a few of the models take the center of Joaquin out to sea, well to the east of the U.S. East Coast. Yet, several others move the hurricane up toward the North Carolina, New Jersey Coastline. That would be bad news for areas from Cape Hatteras up to Norfolk, Va and surrounding areas. But this solution is certainly not set in stone! In fact, there is a full 700 miles between the track farthest east and the track farthest west. We call this the "Cone of Uncertainty." And let me just say, this cone is mighty wide. Also, notice that a couple of the computer guidance models actually bring the center of Joaquin into Ohio by early next week! Of course, by then, the storm would no longer be a tropical storm or hurricane. But it would still provide us with plenty to talk about, including heavy rains and lots of wind Sunday night through Monday! But remember, there is still no clear path for Joaquin. Much is unknown. That's why we are watching...closely. UPDATED: To reflect Joaquin's newly- designated hurricane status.